The Coffee Diaries… and The Gym. While I had The Bug, I wasn’t drinking any coffee. I’m not a huge coffee drinker in the first place – I only have a cup a day – but I am pretty dependent on that first-thing morning cup (as long as it’s not Starbucks Natural Fusions Cinnamon). Fortunately for me, I didn’t notice the withdrawal effects during The Bug because I was too busy throwing up or trying not to throw up. Then by the time The Bug was out of my system, I was officially un-addicted to caffeine! Proud of my new healthy lifestyle, I decided not to drink coffee anymore, except for VSO’s (Very Special Occasions). 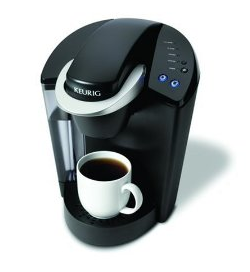 Or getting the Keurig off our registry (yes, that was a shameless plug for our Bed Bath & Beyond registry). Well, that resolution lasted about two weeks. If you can even count that. I was lying to myself, telling myself I felt sooooo energetic now that I didn’t have the ups and downs of caffeine with the crash at the end… meanwhile I was falling asleep every time I sat down long enough to blink. I knew something had to be done when I started getting too tired to trust myself driving the girls. So on the *really bad days* (which was everyday), I started having a Diet Coke with lunch. Which really helped! I felt great in the afternoons. But still felt drugged in the mornings. And knew that Diet Coke is probably worse than coffee. Tuesday I stopped lying to myself and stopped for an iced coffee at Dunkin Donuts on the way back from the preschool pick-up. “Getting coffee?” two little voices asked from the backseat. Oh, the shame. Today I finally gave in and had my “normal” morning cup of coffee in front of everyone (okay, so it was in front of the mom I work for and the girls. But I might as well have worn a tee-shirt that said “WEAK”). But I am getting better at something. I went to the gym today for the first time in… ever. I cut the tags off a sports bra I bought at least 2 years ago. I delightfully found a pair of gym shorts that I forgot I even had, but then vaguely remember wearing to a yoga class at some point. My Nalgene bottle finally came down off the shelf. And I met up with the lovely Ashlee and “ran” (do you run on an elliptical?) for two miles/a half hour. Not too bad. Maybe that’s a leaf I can actually turn over! Categories: Fun with Friends, Kids & Nannying, Random Rants | Tags: ashlee, caffeine, caffeine addiction, coffee, elliptical, gym, keurig, nannying, registry, running | Permalink. $8.79 Coffee Doesn’t Really Taste Great. I was at ACME with Dayne the other night and started pulling out my oft-neglected coupons, and realized I had two for gourmet coffee – one for Starbucks Natural Fusions and one for Melitta. So I decided to go crazy and get both. Starbucks in Cinnamon and Melitta in Hazelnut Crème Brûlée (wow, it was entirely too much fun finding those little letter accents on my keyboard). They both come in such itty-bitty bags that I figured getting two would last me for maybe a month or so before I go back to my old, cheap, trusty fall-back – Maxwell House Original Roast (it’s good to the last drop). So this morning, even though I’m sick and not really in a coffee kind of mood, I was reminded that I have a May expiration date to adhere to with an $8.79 price tag! Thus, I decided to crack the bag open. 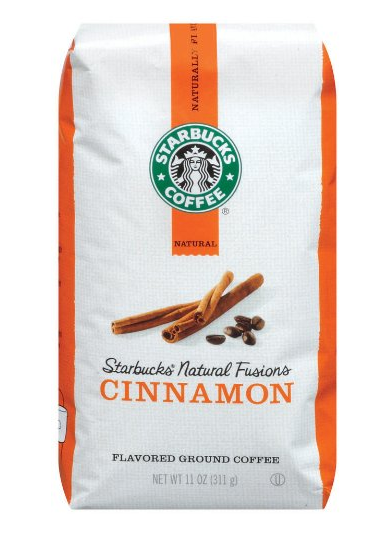 I’m not really a huge cinnamon fan — yes, maybe a dash of it on my applesauce, and by all means sprinkle it on my french toast — but in my coffee? Go away. It’s awful. Maybe not awful if you’re into that kind of thing – cinnamon tar water, that is – but I ended up dumping french vanilla creamer into it and calling it a day. After forcing myself to drink almost the entire cup, I feel like I’m going to be dehydrated for the next 72 hours. As a disclaimer, it’s really not bad tasting, it is just entirely too strong. And entirely too expensive. And I am entirely too stupid to ever try and use coupons again. On that note, however, I’m really looking forward to the Melitta Hazelnut Crème Brûlée. Not only is it a better-sounding flavor, but full price was only about $5.49. And now that I double-checked my receipt, I saw that it was actually on sale for $5.19. That’s the kind of price I can live with. Categories: Random Rants | Tags: acme, coffee, coupons, grocery shopping, melitta, starbucks natural fusions | Permalink.